The EURATOM Treaty is one of the founding treaties of the European Union and dates back to the year 1957. The Treaty established the European Atomic Energy Community (EURATOM). Since it came into effect, the Treaty has never been revised - despite various reform processes on the European Union level (such as Lisbon, for instance) and the enormous shift in public opinion on the use of nuclear power. Since 1957, EURATOM grants substantial financial and structural privileges to the atomic industry. This results in a massive distortion of competition within the framework of the allegedly free internal European Union energy market – to the detriment of renewables. 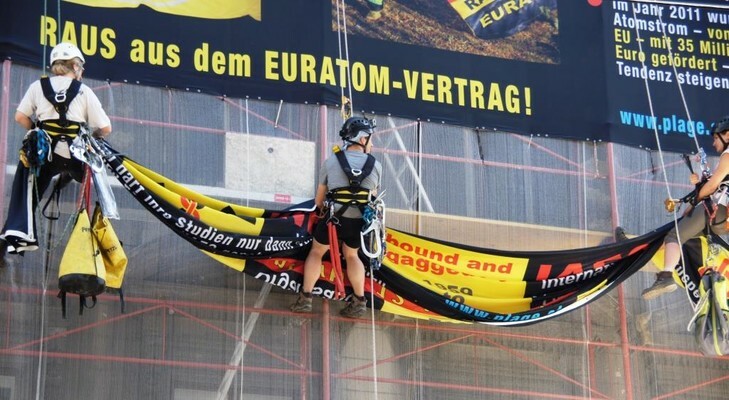 The EURATOM Manifesto aims at raising awareness for the EURATOM issue among German non-governmental and civil society organisations in the first place. Creating synergies, we thus seek to to increase pressure on German politics to exit EURATOM or to advocate for revising the EURATOM treaty on the European Union level in the long run. The Manifesto contains sufficient arguments and motivation for signing it. At present, the decisive motive for supporting our Manifesto may be the European Commission’s approval of tremendous British state subsidies for the planned Hinkley Point C power plant in Somerset, UK. Which creates a precedent for nuclear new build at any cost in all other pro-nuclear member states! Austria has filed a complaint with the European Court of Justice. Since there is hardly a chance for the British government and the EU Commission of winning the case on the basis of EU subsidy rules, they have largely built their legal argument on the EURATOM Treaty of 1957. As signatories, the Manifesto targets German NGOs, enterprises in the renewables and efficiency business and major actors in the anti-nuclear and related social movements. For the time being, we concentrate our efforts on countries such as Germany promising the best chances for official politics to take up the cause of EURATOM revision or exit. However, it is important that people interested and involved in similar issues in the rest of Europe and overseas become aware of the EURATOM Manifesto and our EURATOM WATCH Bulletin. We welcome your support, advice and questions.